Well, it checks a number of things that i have found are the key things that make an Essentials Server tick. That is IIS and MOST IMPORTANTLY, Certificate Services. I knew that the CA was pretty significant to an Essentials Server, but i didn’t know just how deep that significance went. In your Local Machine Certificate Store you have a number of Certificates, perhaps the most important file on the whole server (aside from perhaps ntds.dit) is your Certificate Authority Root Certificate. Without that, you cannot correctly reinstall the CA, and without that CA, you can’t do anything. It is not just a case that you cant reinstall the CA, you can. The CA requires a specific name, and if you reinstall and generate a new key, the name is not likely to remain correct. There may well be a way to get around even that scenario by hacking the crap out of AD, but honestly, i think i might take a reinstall over that. That was a bit of a side track, so, again, what does this tool do? Firstly it will decide if you are running on Essentials 2011, 2012 or 2012 R2. It will then give you the choice of testing IIS or your CA. If you choose to test your IIS Configuration, it will inspect your Web Site Configuration, your Application Pools, Virtual Directories and ISAPI filters as well as your Web Site Bindings. When you check the CA, it will check that the CA is available, that it has the right name (that is important), that the certificate set in the Registry for the Dashboard matches what you have in your Local Machine Store, it will even download a copy of the CRL from your server and test that it is publishing the right information. It compares all of this information to ‘’Defaults’ and lets you know where you may have problems. I have run it against SBS 2011 Essentials, Essentials 2012, and R2, and it has identified the deliberate errors i have introduced and reported back correctly once those have been repaired. i haven’t made it to be an exhaustive tool of everything that could possibly go wrong on an Essentials Server, it really is just focussed on IIS and the CA, even then it may not cover every scenario. Hopefully if you do come across a broken Essentials Server using this will do enough to point you to the fix, or at least help to rule some things out. I get a ton of errors when running the CA tests….any idea where to start looking/reading to fix these? Get-ItemProperty : Cannot find path ‘C:\windows\temp\crl.crl’ because it does not exist. Remove-Item : Cannot find path ‘C:\windows\temp\crl.crl’ because it does not exist. sorry for slow response. you need to look at the CA and see if it is running. are you able to open the dashboard? Hi mate. Did you ever resolve the issue with Dashboard Certificates without formatting and starting again? I have run the tester and got a similar outcome. Do you want to email me a screen shot of the output? Hi Robert. thanks for a prompt reply. I have 2 extracts to email. The CA and the IIS tests. What is your email? I hope these files find their way to you. Any help is greatly appreciated. Hey Robert thank you for your post, I am 99% done with this configuration, but when i ran your tool I got this message, any idea where to start looking at this. This tool will check your current Configuration against known Essentials 2012 Values. Is the Dashboard opening ok? Yes it opens ok. I can go to the domain name internally, but I cannot get it to render by dns or IP externally. I can also get to the connect page to download the connector internally but not externally. The configuration wizard, gives me the error saying Anywhere access to your server is blocked, that port 80 and 443 are blocked, but they are open on the firewall. It also tells me that Port forwarding is not configured correctly on your router, which it is. I read some more on these errors on Microsoft partner network, and they said that they can be ignored. I think I have a cert or a routing issue. The cert is installed correctly, at least I think, though I do not know what I am missing on the routing, cause I thought I covered everything. Sounds like you have not opened the ports on your router, given that it is not working externally and you have those errors. At the very least confirm your servers internal IP and check port forwarding on your router. It is also possible your ISP are blocking these ports. If the dashboard opens you may be able to discard the certificate error in the tool. It was a firewall issue, the firewall rules were in place, but not working cause the firewall needed a firmware update. Once I updated the firmware on the firewall, then everything worked. Have you reinstalled Certificate Services? Do I have to uninstall and reinstall the CA Role? Is that what you mean? No I am asking if you have already at some point. OK, that is strange that it would report the CA name is incorrect then. What problems are you having with the server – perhaps I can suggest opening a thread on the TechNet forum where it is easier to provide answers. My only problem is with the internal WSS Certificate Web Server. I get Parsing Errors when I go to http://servername/connect. Obviously this is very bad as I cannot join new computers to the SBS. I received a 403. Great tool, BTW. I’m just trying to figure out how to re-test the HTTP request. One thing I like to do in my scripting is to echo the call if it returns an error. All we see below is that it happened, and roughly where, but we can’t see the HTTPS call it made. I have re-written that bit just now because looking back at it, it seems a bit backwards. Right click the downloaded ps1 file, go to properties and make sure you click Unblock. I am not sure this script will be much help to diagnose Trust issues. Do you have a thread open on the TechNet forum? Thanks for answering. Yes I do have a thread on the Windows Server 2012 Essentials forum. But, I came in this morning and those 3 client pc’s with the trust issue, are able to log in to the domain WITHOUT the trust issue. Don’t want to “look a gift horse in the mouth” but would llike to know why:\. Only thing that changed was more windows updates being installed. Difficult to say really, I have seen inexplicable trust issues on Windows 7 clients on a number of domains. Also, I did “Unblock” your file and it is running just fine. Can you tell me why the name of the CA is important? I ran the test and the WSS Cert Server was showing Red status. I did a test in IIS Mgr in the Basic Settings Properties and the Pass-Thru authentication failed on the WSS Cert. Server Service folder? I replaced the Owner and amended permissions on the Folder and it still fails. If I change the Authentication to a specific user it works, but Connector Tool still does not? Any help appreciated. I think those settings are as they should be, and if I remember correctly that test will fail. Can you put those settings back as they were and then rerun the test and post a screen shot? I have a client that runs Server 2012 R2 Essentials server. After the initial client machines were connected and configured, the client wanted to set up Anywhere Access with a self signed cert, and tried various methods of installing the cert using IIS, all of which failed. Later, they installed a commercial cert. All original certs were left in the server. Anywhere access and every part of the network works fine, however, when you attempt to connect a new computer using the Essential Connector application (https:///connect ), it fails to run successfully. All other aspects of the tester seem to pass successfully. Any advice on how to resolve this issue? All help would be greatly appreciated. If you go to that URL in a browser, does it download the file or give an error? If I go to https://servername/connect, it downloads the file. The file will start, but doesn’t “find” the essentials server. It defaults to the second option on the screen that asks what server, using the IP address. I can have it find the correct server in the first (top) option, but it says it can’t get the information it needs from the server and to contact the administrator. Perhaps, I misunderstood with my earlier reply. Did you mean the URL for the connector, for the CRL Location, or the CRLDestination? The CRL Location URL fails with a 404 error, when accessed from the client PC. Also, if you could, please edit my original post to change the initial part of the .crl name to be XXXXX. I would appreciate it. Same with the username. Thanks. Your blog doesn’t allow me to edit the original post. Did you reinstall Certificate services at all? It sounds like the CRL is either not being published correctly in CA, or the file is there but IIS is blocking it. If you go into IIS can you see the virtual directory for CertEnroll? I can’t say what was done prior in any detail regarding trying to use the self-signed cert, other than what I outlined above. I do know that they tried using the IIS tools to set up the self signed cert, as opposed to the Essentials wizard for installing a commercial cert using the Anywhere Access wizard. I have since run the Anywhere Access wizard to install a commercial cert. I do see the virtual directory for CertEnroll in IIS. and if you explorer the virtual directory, what do you see there? If I go to advanced view, and look at the source location, the files are there, if that is what you are asking. If you right click the Virtual Directory, then click explore, it should open up c:\windows\System32\CertSrv\CertEnroll and you should have about 4 files listed. Do you have a screen shot of the 404 page, or the exact wording of the error? I do have four files listed. Two CRL files, one .asp, and one .crt. The 404 page says: Not Found. HTTP Error 404. The requested resource is not found. Not sure how much more help I can be through forum type support, id offer to logon and take a look if that is something you are interested in. That could work. How do you propose we arrange this? Forgive me, Robert, but I can’t find your email anywhere on your site. You have mine, included in the post information, if you can shoot me an email, we can set something up. Thanks so much! Due to Robert’s brilliant help on this, we tracked the problem down to two things. Not only was the wrong cert being used, but, the HTTP: binding for the default site had somehow had the Host Name field filled with “Default Web Site,” which prevented all access to the crl. Once the field was made blank, and the correct cert in place, restarting the IIS services enabled everything to work correctly. Robert, I can’t thank you enough for this! Hi Robert, I’m a bit of a novice when it comes to Windows Server 2012 but I’m having an issue where none of the client computers are backing up. I’m seeing a NotConfigured error in the event logs on the client machines although from what I can see it is configured correctly. There is very little info on this problem in google land but I came across this site on my travels. I ran the configuration tool on the server with no errors but I got a ‘Client DNS Server’ error when I ran it on one of the clients. Problem is I’m not sure how to troubleshoot that or even if it is related to the backup issue. Any help you could offer would be greatly appreciated! The client should use the servers IP as a static dns entry. Hi Robert, thanks for the reply! Sorry I didn’t see it until now. I checked the ipv4 properties in adapter settings on the client and it’s set to obtain DNS server address automatically. Should I set this to the server’s IP? I ran your essentials tester script on the client and am getting an error for the Client DNS Server. I tried setting the DNS IP to the server’s IP but I get the same result. Do you have third party firewall or AV on the Server? No third party AV or FW’s are on the server. I believe that someone else has tried to fix this issue previously and has added and removed different roles from the server previously. Everything appears to be functioning as it supposed to be, just not able to join the domain via the http://servername/connect method. Although I am able to join manually via the local computers system properties. Then also their backups have been failing and the server itself is unable to see the client machines. Can you check that the Windows firewall is enabled and has exceptions for those ports? I went ahead and created a custom rule to allow those ports access. Unfortunately not luck, are these ports supposed to be in the bindings for IIS? If so, I am not seeing them there. No, 6602 and 8192 are not used in IIS. Can you see anything listenting on those ports if you do a NetStat command? That’s a typo actually, it should be 8912 not 8192. It does test the correct port, but displays incorrectly. Will fix that. On my server I have processes listening on both ports. What are the settings of your custom rules? 8912 is a UDP port. 6602 is TCP. Given that there are instances listening, i would say go back and check your firewall config. will do, thank you for the advice. If I were to simply disable the FW temporarily after hours and then test. Could we eliminate that portion? After hours this evening, I disabled all FW’s (local PC FW, Server FW, and Network FW) and I am unable able to telnet to those two ports 8912 and 6602. Although they report to be listening…any thoughts? I am able to connect on 443 and 80 obviously. What does the tool report from the client now? Test a backup, dont rely on a telnet to the port. The client tool is still unable to connect with all firewalls disabled. I also went ahead and tried the http://servername/connect method and the error message “An unexpected error has occurred. To resolve this issue, contact the person responsible for your network”….unfortunately that is me, and I am unsure of the solution. Then I did run your PS tool and it claimed that there are errors on those ports. Any other suggestions? Robert, I just did a brand new installation of Server Essentials Experience on a Server 2012 R2 box. I ran the tool, and an error was generated on the CRL Destination check. It returned the error (503) Server Unavailable. I hopped over to IIS to check the bindings, and things appear to be fine. Do you have any suggestions on what else to check? I tried navigating to http://servername/connect, and it is also giving the 503 Server Unavailable error. That was the only error? Hi, thank you for the useful Tool. My Main Problem is i can’t join new Computers to the Domain because the Connector Website is not accessible anymore. Sounds like your Certificate Authority is not running, is the service running? I am getting a 403 Forbidden (You do not have permission to view this directory or page using the credentials that you supplied) when trying to connect a new client to an existing Essentials 2012 R2 server. Running EssentialsTester.ps1 shows a failure on CRL Download and 3 tests on Dashboard Certifcate with 1 OK and 2 Errors. I am at a loss on where to correct this, and I am certain it has something to do with my attempts to set up Anywhere Access several months ago (this is the first client I’ve tried to add since then). Go to http://titlerequired.com/support and send over your results from the tester. This was ultimately fixed with your help! After we got rid of the extra console certificates, the rest of the problem was fixed by unchecking “Use SSL” from the default web site under IIS (I’m sure I toggled that either in troubleshooting myself or when I set up Remote Access a few months ago. You should start by checking how many certificates you have for the server in the local machine store – it appears you have 3 and you should only have 1. I think the String is for LocalMachineCert – this is a thumbprint ID. and it should match one of the certs in the local machine store. You should remove the other two. I’ve identified the correct certificate. Can you provide instruction on removing the others? Also, any chance of removing my server name above in the test results? I unpublished the comment so it should no longer be visible. Just right click and hit delete. Okay, just deleted the 2 extra certificates with not matching the thumbprint from LocalMachineCert. Now the EssentialsTester does one “Dashboard” check and it passes. However, there is still a CRL download failure, as I’m sure would be expected at this point. IIS test returns the same, it appears. Are these okay to leave in? Click on Default Web Site. On the right, find Authentication. What is Enabled? Click on WSS Cert Web Site, On the right, find Authentication. What is Enabled? Default Web Site: Only “Anonymous Authentication” is enabled. WSS Cert. Web Site: Only “Anonymous Authentication” is enabled. Under Default website, move to the ‘CertEnroll’ directory. What authentication is enabled? As with the others, only “Anonymous Authentication” is enabled. Now something odd has occurred. The WSE Dashboard says there are ZERO computers attached. Before, as in this morning, there were 7 including the server. I’m wondering if removing those “extra” certificates had something to do with it, but I don’t know. I’m assuming that client computer backups won’t take place now, which is a Bad Thing. Assuming you deleted the correct certificate this would have been ok. If you have a backup of the server I can explain how to recover them. Can you confirm at least that the remaining ‘server’ certificate has a thimbprint that matches the registry entry? I can confirm the thumbprint matches the registry key. Id be inclined to crack on then and not worry about the other certs currently. Fixing the auth issue should rule out a lot of issues and get connect working again. I will be back in the office tomorrow and can compare my lab settings to yours. Also I have backups (twice a day). I, too, suspect the connect site issue will fix all. I assume once that’s going, I can just run connect again and all will be well..
Sidebar: I’m in the process of migrating the WSE2012R2 server to new hardware, but have only gotten so far as creating a new replica domain controller; I haven’t moved the FMSO roles or promoted the new box to a domain controller. Hopefully that doesn’t impact what we’re doing here directly. That happens in a couple of days, but I would like to get this healthy again before I press on. If you are migrating, you will have to reinstall the connector software anyway, and will be starting with fresh backups of your PCs. It may be just as well to finish your migration than spend time troubleshooting here. I also don’t want to impose on you unnecessarily. If this is something I can figure out in one or two more steps, fantastic! If it’s going to be a long, drawn-out detective process, I may have a change of heart. I understand what you mean. It is difficult to say how long it would take to resolve, hopefully not too long. I suspect you have tweaked IIS to get Anywhere Access working, and with Essentials the last thing you want to do is tweak iis, or play with the certificates. Can you send a screen shot of the 403 Error for /Connect ? Also, WSE Best Practices Analyzer complains “Certificate subject does not match the name configured by the Domain Name wizard.” I’m only including that in case it helps narrow things down. Just realised you installed Wsus. Did you install that to its own website or under default website? WSUS Administration is at the same “level” as Default Web Site, Mac Web Service and WSS Certificate Website. First of all, thank you very much for this amazing script, I have been slowly unwinding the results of a failure caused by using the “Use Express Instalation Files” feature in WSUS. However, when running option 1, there is only one item left, which I have been wracking my brains out on. I have been looking at many different things and this is the only thing I can’t resolve at this point. What am I missing? Any help you can provide is appreciated! Ah yes that last one is tricky. This setting was propagating to all the other AppPools and kept repopulating everytime I restarted the Windows Process Activation service. Running this command, removed the scheme and once again allowed everything to run as it should! that led to this message and finally fixed! thanks for your help! 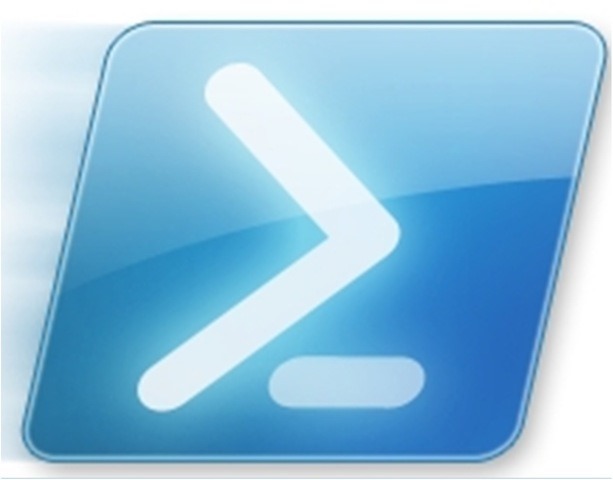 and that amazing EssentialsTroubleshooter powershell, it really led me back to a working system! The worker process is unable to read the applicationhost.config or web.config file. There is malformed XML in the applicationhost.config or web.config file. The server cannot access the applicationhost.config or web.config file because of incorrect NTFS permissions. Look in the event logs for information about why the configuration files are not readable. Make sure the user identity specified for the application pool, or the authenticated user, has the required permissions to access the web.config file. I’ve downloaded your splendid script and run it against a new 2012 R2 WSE role without error. Anywhere Access to your server is blocked. There may be more than one router on your network. This is my 3rd installation of WSE on 2012 R2 in the last couple of months and the 1st 2 worked like a dream :-(. This installation has a Meraki MX64 WAN Security Device and a Meraki MR34 WAP. I have a VPN set up between this site and HQ across the Meraki network and a two-way Domain Trust is in place. I’d appreciate it if you could offer any advice to fix this. Have you confirmed the ports are open correctly and accessible from outside? Some routers are not comfortable doing nat loopback which is essentially how the AA wizard tries to verify external connectivity. I guess your setup is similar to the other installs you did – what is different here, ISP? Router? I have one site connecting through a Meraki MX 80 using NAT, but this site is just using a port forwarding rule through the MX64 for 443 and 80. I’ve done a test for 443 and 80 externally and it is reporting that they are blocked, so I’ve asked the IT guy there to investigate if the ISP has them blocked by default. I’m also looking to put WSE AA onto its own external WAN IP so I can use NAT. Very many thanks for your swift response. Turns out there are some issues port forwarding 80,443 on a Meraki MX64 which I am investigating at the moment. Best to use 1:1 NAT, which leads me onto…. This site only has a single WAN IP address so I’m looking into upgrading (hopefully will not cost too much) to multiple so I can assign Anywhere Access to its own WAN IP and use NAT. I ran this tool and now my connector doesn’t work. When I try to launch the connector from a client it says “Your server cannot be located. Enter Server’s name or IP address to proceed”. It doesn’t see the server if I enter Name or IP address. I can add the machines to the domain manually. Do you know if the script changed anything that may have caused the connector to stop working? The script makes no changes to any settings, it only reads the current configuration and compares it to known defaults. Hi Rob can you help with my issues? Only Errors will be shown. There should be a log in the %appdata% folder for the script. Can you send me that? It looks to me like you have a CA issue, have you changed anything CA related – uninstalled/reinstalled? Depending on your position, you may find it easier to remove the Essentials role and CA and reinstall it. Although some of the components you need to ‘repair’ your CA may not be present, meaning you will be looking at using more creative methods to repair the server! So we have a couple of issues here. I would fix the Dashboard certificate first as that is likely to be easiest. You need to work out which certificate is correct. To do that, you need to check the registry. HKLM>Software>Microsoft>Windows Server>Identity there will be a RE here with a thumbprint ID. It should match one of the certificates in your local machine personal store. It looks like you currently have four certificates in the store, three of which show as errors above. Once you have identified the correct one, remove the others. Can you go to http://server/connect and get the full error message displayed? This will help troubleshoot further. I was able to remove the unneeded certificates. This tool will check your current Configuration against known Essentials Server Values. Can you confirm what Identity the Client_App AppPool is running under? The Client_App AppPool is running under the NetworkService identity. 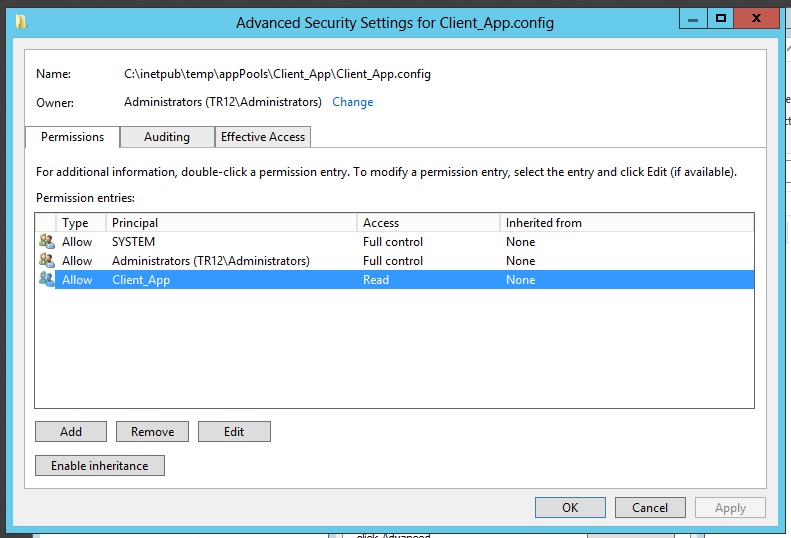 The IIS_IUSRS group does not have any explicit permissions on the Client_App.config file. The owner of the file is the Domain Administrators group; SYSTEM and Domain Administrators groups have Full Control, the Client_App group has Read access. On my lab system that group does have permissions on that folder. Can you set it to have Read&Execute? then probably reboot the server is best. I was looking at the permissions to the file Client_App.config instead of looking at the permissions for the folder. The folder from which that file perhaps inherits its permissions, C:\inetpub\temp\apppools\Client_App\ does have the IIS_IUSRS group listed. That group has Read, Read & Execute, and List Folder Contents. If you drill down all the way to the Client_App.config file, the ‘Client_App’ user account should have Read access. Can you confirm that? Yes, that’s exactly what I see when I view the properties of the Client_App.config file. I thought I’d follow up with you to let you know how I fixed the permissions issue. Get-Item : Cannot find path ‘C:\ProgramData\Microsoft\Windows Server\Data\CAROOT.cer’ because it does not exist. Do you have suggestions on how to fix this? Thank you! Can you manually confirm if that file exists? I believe you can simply export the CARoot Certificate (in cer format) and place it in there, make sure to name it correctly. Exception calling “Import” with “1” argument(s): “Array may not be empty or null. Any ideas on how to fix this? Thank you again! Sorry for delayed response, I have been unwell! Robert, thanks for this tool! It has found my config problem; now if only I what to do to fix it! I have a 2012 R2 server, and am trying to add a Windows 10 client. The computerConnector fails during the configuration, and by browsing logs I saw that I’m having cert problems. History: When server was setup it had domain name of company.com, then after setup, in the midst of trying to get anywhere access working, the domain name was changed to zone.company.com. That was 7 months ago. Server works well, except for anywhere access and, of course, ability to add new clients. The ca-name is company-server3-ca, when apparently it wants to be zone-server3-ca. Can you point me to guidance on clearing up my mess? You renamed the internal domain name? What does the config tester suggest is wrong? What does it say the problem is? Did you rename your internal domain name? The server started life as server3.company.com, and later was renamed to be server3.home.company.com (with home.company.com being my home network where Server Essentials lives, and company.com being hosted elsewhere with a DNS pointer to this server for this subdomain). So you renamed the Domain? I’m not sure of a way out of that. You will probably have to uninstall the Essentials Role and CA, then reinstall the Essentials Role which should build a new CA for you with the correct name. But of course doing this will mean you lose client backup history and will have to reinstall the connector on the computers. Not the best word to hear, but not the end of the world, either. There are only a few client computers involved, so the re-connects won’t be too bad. As long as storage pools and network/DNS configuration is preserved on the server I can weather the loss of backup history. Step 1 is ensuring a good backup of server before starting remediation. Thanks, Robert, for your insight. And for the tool that started this discussion. You are a life-saver. I have been debugging an issue where I could not connect clients to an Essentials server. I had tried everything but your script pointed me towards the CA being the problem (“Certificate Authority Online : Error”). It turned out that Active Directory Certificate Services would not start due to a corrupted log. I restored it from backup and now it works great. Thanks, this saved me from having to rebuild this server. I di d run your script and found 7 errors. I’ve never work with power shell or that setting up servers like that. I’m running Server Essential 2012 and currently I started to have a problem with joining to domain. I thought i had done that already (version 2.07) may not have published it though. Your tool has been really helpful in trying to resolve our issue but I am stuck at a point, our server has been migrated from SBS 2011, I didn’t build it and whoever did missed out the CA so I have added that back in which resolved the IIS issues found in step one but now I have issues in step 2, can you help me? Can you share a bit more about the environment? Version of Essentials? Client computers? Status of the Essentials install? I am migrating from SBS2011 (using your excellent guide) to a 2016 server with the essentials experience add-in. It has been a painful experience because various users need to be allowed to add-in as a service / batch job. There seems to be no definitive documentation on what those are. Since the (eg, Anywhere Access) wizards give no clue as to what the problem is and, as the log files are hard to find, voluminous and impenetrable, it makes for a lengthy journey. I’ll give this tool a whirl to see whether everything is settled. Running into an issue were clients are indicating offline, failed backup status. Appears to have started after failed attempt to implement direct access. Connect website returns 403 forbidden on http and certificate error on https. I couldn’t get the connector software to install on windows 10 Pro connecting to Server 2016. Kept giving me ‘server not available’ after entering the credentials. I used your Powershell program and the only thing is error was TLS1.0. Been trying to get the connector to work for months. I had changed my IIS settings to only use TLS1.2, but it seems the connector only works with TLS1.0 (I know.. right?). I had to disable TLS1.2 and TLS1.1 and enable TLS1.0 in IIS registry to get connector to install. At home I have a Windows Server 2012 Essentials server (not R2) and I have installed the connector software for Windows Server Essentials on al my PC’s and portables. I think that at the time all my workstations were on Windows 7 and Windows 8 and there was no problem connecting the workstations. Now i want to connect my first Windows 10 Pro PC but the connector software keeps failing and i cannot connect this PC to my server. The connector seems to be working because i get several screens (finding server, getting started, username and password selection) but after i have entered a username and password i get the following error: Cannot connect this computer to the network. The server is not available. Try connecting this computer again, or for more information, see Troubleshoot connecting computers to the server. I have run the troubleshooter and that says that the binding is missing on the default web site. I don’t know if there is a link between this problem and the connector that’s not working. But how can i fix the missing binding error? What bindings do you have on the default website? In iis, under default website. You have an https binding missing. Now your troubleshooter does not give any errors anymore. When I try to connect a Microsoft Surface 3 with Windows 10 Pro to the Windows Server 2012 Essentials server (not R2) with the connector software i get the following error: Cannot connect this computer to the network. The server is not available. Try connecting this computer again, or for more information, see Troubleshoot connecting computers to the server. Have you disabled tls 1.0 on the server or client? When I run your troubleshooter “Checking TLS Version 1.0” does not give an error. Is that enough to be sure that tls 1.0 is enabled or do I have to check elsewhere? Can you upload the logs from the windows 10 machine? How can I upload the logs? One drive? Dropbox? The choice is yours! Everything else checks out..when running the connector on PC’s (Windows 10) I get the error that the server is not available. Any suggestions? Looks like a few issues there, can you say what the history of the box is? It is a new VM server, we just migrated from SBS 2011, I believe the CA was moved from the SBS server. My box was a SBS 2011 to Essentials 2016 transfer, I can’t find any information on Connect certificate, but I’m thinking it’s trying to use the certificate from SBS 2011 and that’s why it’s failing. Script worked well in identifying my issues. I ran the script to check the install after we set the system up and no errors, very please man on this end! I had a bunch of things we planned so started on the list….Started trying to connect a NAS to my domain and installed iSCSI to services be able to integrate. This did not work and I decided to remove the role from my WSE 2016 – bad mistake! The removal trashed the setup and it was so bad that I could not get the dashboard to start fixing the mess. After looking at the avalanche of error messages I decided to roll back the server state. This has brought stability to the place but clients are faster at getting their data from the web through OneDrive than from the shared drives or folders. I ran your tool again and the ONLY outstanding issue is that it cannot find the CAROOT.cer file on the server – it is not there. It shouldn’t affect file access speed that may be more down to NIC Config/Drivers. Did you also benchmark that before? Ok, my dashboard is NOT opening..I assume it is due to multiple certs being in here? and if so how do I delete the baddies? Yes, it is likely if you have multiple certs. Can you send a screen shot of the errors? When I try to open the dashboard in S2012R2 it closes immediately after it building the GUI.. with no errors on screen.. the the error logs I see this. Can you download the tester again, i fixed a bug in the output. Still shows two bad certs in the dashboard. Strange it should only list one thumbprint under ‘current’. Would you send a screen shot rather than copy/paste? In any case the registry value for the dashboard certificate does not match the certificates installed. Also, we have replaced our curret cert for the recent Google cert update issue..
Ill drop you an email. Robert – I have been searching everywhere to solve my Certificate Authority Cert: Errors Detected – Local Machine Store. I am still running WSE 2012 (not R2). Reading the above thread I found the Registry contains one value for the LocalMachineCert, wheras the certsrv (Certification Authority (Local)) contains a completely different one – both based on the Windows ServerSolutionsComputerCertificateTemplate. Can I just copy the one from the certsrv over the entry in the registry to make them match? I certainly don’t want to do anything that would prevent the machine from booting! THe Dashboard launches but several services that depend on Windows Server Search all fail because the search service fails immediately on launch. I’d make sure you have a good backup as well so you can always go back. Thanks for the quick reply. I did make an image backup and then followed your recommendation. The PowerShell admin window where I typed the command stayed open for about 3 seconds and then closed. I rebooted and ran the essentialstester (7-27-18) again and it reports Binding Missing: Default Web Site and Certificate Authority Cert: Errors Detected – Local Machine Store. Under Testing Dashboard Certificate – the value remains identical to the one I found before all this in the registry and is different from the one shown in certsrv, so I’m not sure whether the command given above had any effect at all or if I made some error. To rule this out – I tried it again after a cold boot by copying and pasting the command into admin powershell – but the results are the same. Robert – I am feeling quite silly at the moment – I looked once again to see how to verify the Local Machine Store – and after opening Certificates(Local Computer)\Personal\Certificates ASUS-P5WDH (my servername) – I find that the thumbprint of this certificate DOES MATCH the value in the registry HKLM>Software\Microsoft\Windows Server\Identity except it is listed in lowercase in the mmc snapin and as an uppercase REG_SZ in the registry. So I am now well and truly confused why the essentials tester is reporting an error in the Local Machine Store. I tried to resolve this by marking the original Dashboard certificate as revoked – superseded, rebooted, but the results are still the same. Its just showing you, that you have another dashboard cert that may be an issue. It is only shown for informational purposes. Sounds like you have fixed your issues though. Having difficulty connecting a new Win 10 Client PC to our Server 2012 r2 essentials using the connector. It finds the server but cannot connect. All the following are showing red but we are not expert server administrators and would appreciate some guidance on how to fix these SSL related errors. No other errors for all the other tasks. OK, go into IIS Management. Expand Default Web Site, go to /Connect. In the right hand side find SSL Settings. Make sure ‘require SSL’ is unticked and the other setting, is set to ignore. Under /Customisation, look at Authentication Settings, make sure only ‘Anonymous’ is enabled. Have you by any chanced installed any additional features like RD Gateway Web Access? Hi Robert, I have spent a very long time trying to connect the Win 10 client, and thanks to your help, the issue has been resolved within minutes and the new client is connected – I am very grateful. To answer your other question, yes, we have installed RD Gateway Web access. That is why those errors show as that role is not present or required by essentials. I have been trying for…months! to get my connector working again. Using the Config Tester i have managed to knock off as many errors as i can but i am still getting a 401 error. All clients and ping the server, i have tested clients connecting to fresh installs of server 2016 so i know it is server side. 401 sounds like an authentication issue on the page. Can you post the actual error message?